Burnley was the best club Mark Robertson ever played for. That's what he said in an interview in Australia having retired from the playing side of the game to setting up his own soccer school in 2009. Robertson's arrival at Turf Moor, ahead of the 1997/98 season was somewhat unheralded. He'd arrived in the United Kingdom for trials with Nottingham Forest and Rangers but nothing came of them but, because of Chris Waddle having taken over at Turf Moor, he decided he'd give it one more chance and he impressed Waddle enough to win a contract. He'd played his football for Stanmore Hawks and Marconi Stallions in Australia, but with hopes high and more prominent signings made his arrival really did go virtually unnoticed. He played virtually all of his football for the Clarets during two traumatic seasons, the last two seasons played completely in the 1990s, with his first game coming at Bristol Rovers in 1998. Even then, there was more attention on the other debutant, a striker by the name of Andy Payton who had just signed from Huddersfield. He played a further ten league games during that season, as we escaped relegation on the last day of the season, and one year on, during another season of real struggle, he featured in over half of the games under the new manager Stan Ternent, and scored his first, and only, Burnley goal in a 3-3 Boxing Day draw at York. He wasn't in Ternent's rebuilding plans however and during the 1999/2000 season, as Burnley won promotion, there was only one substitute appearance in the league. That was at Bristol Rovers. and having come on as a sub he was substituted himself later in the game as we went down to a 1-0 defeat. Robertson headed straight for an Australian training camp after that game, a move that infuriated Ternent whose Burnley team had a home game against Bournemouth just four days later. The Aussies were training at Watford but Ternent said: "I'll go down and bring him back myself." Ternent did get him back and Robertson, who had played left back at Bristol, was an unused sub as goals from Graham Branch and Steve Davis gave us a 2-1 win. He wasn't to play league football for us again. The versatile player, who had featured in a number of positions in the first team, returned to Australia to play on loan with Wollongong Wolves as promotion was won and it came as something of a surprise when he was offered a new deal as Burnley prepared for football at a higher level. As it happened, he turned down the deal but was back with the squad for pre-season and when the 2000/01 season got underway. Having offered him a deal, Burnley retained his registration and, with him under 24, wanted a fee for him. That feel came towards the end of August 2000 when Swindon manager Colin Todd paid us an initial £50,000 for his services. For th next five years he played his football on these shores but without ever really establishing himself, although he did win his one full cap with Australia during his time at Dundee. From Swindon, he moved to Dundee, St. Johnstone and finally Stockport before returning home to Australia with Perth Glory. He had a short spell in Hungary with FC Sopron before returning home to end his career with two home town clubs, Sydney FC and Sydney United. His playing career ended young, at just 32, to set up his own soccer school called MR Soccer. Although the MR was chosen because of his initials it has now become commonly known as Mr Soccer. Mark is the director and head coach but works closely alongside his dad Alex and friend Lucas Neill. 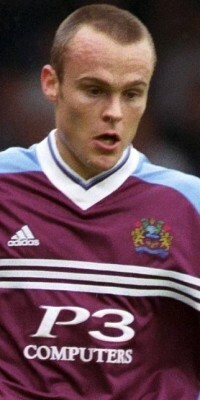 Because of a friendship with Steve Davis during his time at Burnley he offered to send over any prospects at the time when Davis was involved at Turf Moor. HIs Mr Soccer continues to do well in Sydney.